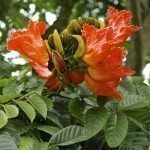 Hi - My mature african tulip tree tipped half out of the ground during hurricane Irma... Rather than loose the tree I had it cut to a stump and dozens of new growth "branches" are growing from the remains... Question is: Can I maintain it as a bush and have it flower? Or should I just select a few best branches and remove the rest to re-shape it as a tree again? Thanks for any information - Regards, Bea Elliott Winter Haven, Fl. Personally, I would just select a few branches to keep. Not because it would hurt the plant, but because it will eventually be harder to control as a large shrub. Either way you decide is acceptable.